Last Friday, the CDPQInfra released an article entitled “Claims and Realities regarding the REM project”. It appears they want to address some of the criticisms that many have raised. Unfortunately, their article of supposed “claims” vs supposed “reality” includes many big inaccuracies, so I’m feeling compelled to provide counterpoints to their “reality”. I know at the end of the day their article is just a PR exercise, but It’s a bit puzzling that they would resort to writing articles that come so dangerously close to being misinformation. In short, I’m aiming to debunk the caisse’s debunking of concerns. In the following it shows the claim the CDPQInfra presents, then their response, then my response to that. CLAIM #1: Buses, streetcars or tram-trains are technological options that offer the same service and the same performance as automatic light metro, but are much less costly. CLAIM #2: The REM will have a negative impact on existing infrastructure and public transportation networks. CLAIM #4: CDPQ Infra will acquire high-value public infrastructure without compensation. CLAIM #5: CDPQ Infra has not adequately consulted with stakeholders and has not discussed the concerns of citizens and its partners. CLAIM #6: The Québec government no longer has any control over this project. CLAIM #7: To ensure that the REM is profitable, CDPQ Infra will have to set higher rates for users. CDPQ Infra has chosen the solution that combines the most advantages to efficiently meet identified transportation needs. The automated light metro option (part of the LRT family) offers a dedicated corridor, ensuring fast, reliable service. It also guarantees greater safety and lower operating costs than most other systems. Finally, the capacity and flexibility of the automated light metro meets current and future demand, with the REM having the potential to achieve a frequency of 90 seconds. Throughout the world, there are approximately 800 km of automated light rail networks today, four times more than what existed 15 years ago. The CDPQ claimed they studied various alternatives, but they didn’t make this study public. They claim their automatic light metro is the best solution, but they provide no numbers or facts to back up that claim. I would argue that our trunk line, the Mont-Royal tunnel, should be a high capacity line, continued as a heavy rail line (that is, for high capacity) that can serve several times the ridership that the Caisse is proposing. Some people complain that right now, people get a direct connection downtown from Brossard, a single seat ride on a bus. In the future people will be forced to transfer at Panama, and this transfer may increase the perceived ‘cost’ of travelling to make it uncompetitive. Also, buses do have more flexibility for line routing than a fixed rail system. Their claim is that the future BRT on the Champlain bridge would provide sufficient capacity. After all, this has been the plan for years until the Caisse proposed a different one in April. Others lament that we are spending billions building a metro serving the edge of the metropolitan area, with large parking lots that will induce sprawl. They would rather see the billions of dollars spent in more urban areas, where more people live, where they are more likely to take transit and where the billions could create more ridership — and they claim that could be better done with trams, which integrate well with the urban fabric and make cities stronger. Basically both the supposed claim and the response from the Caisse are very vague here, there are many arguments that could be made to support many related ideas. In no way is the Caisse’s claim a strong argument for or against their project. If they have studies proving precise versions of their claims, they should make them public so we can analyze them. 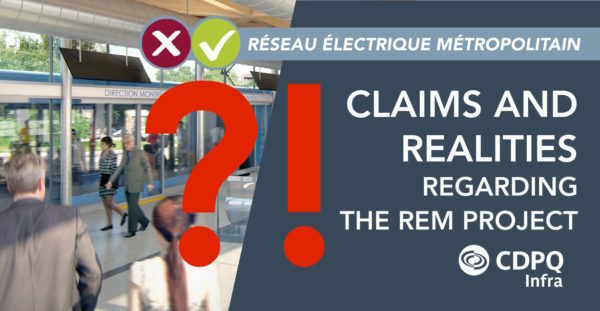 The REM will significantly improve public transportation in the Greater Montréal area. This complementary service will be seamlessly and effectively integrated into existing networks, metro, bus and commuter trains. Working groups are in place with transit authorities to align the REM with other networks in the metropolitan region, to speed up travel time and intermodal transfers. Operation of the REM will modify certain services, such as buses running along the reserved lane on the Champlain Bridge . But mobility in the Greater Montréal area will be significantly improved. 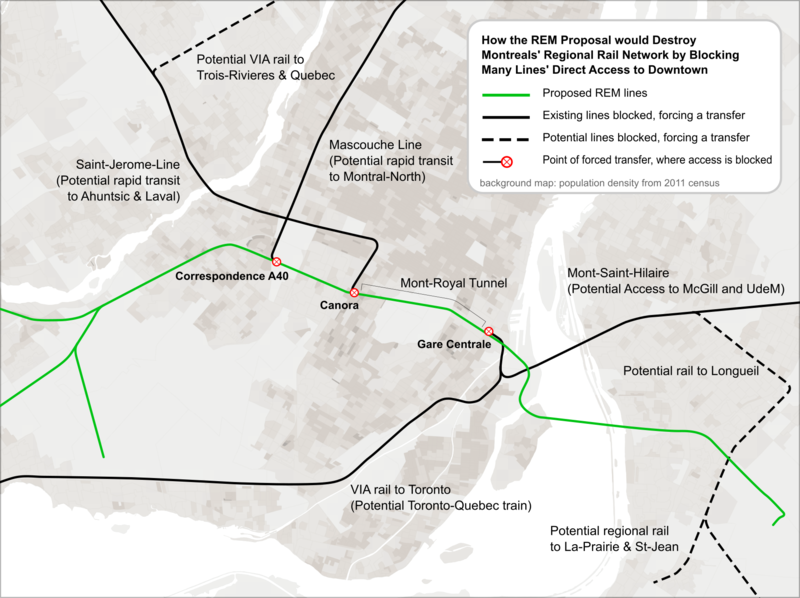 The main issue is the monopolization of the Mont-Royal tunnel and conversion from a potential high capacity trunk line serving many areas to a medium capacity light metro serving fewer areas. Yes those areas (West Island, Brossard) will receive improved service in some sense, but we do that at the expense of serving other areas (North, Est). Expansions to those other areas will be blocked in the future as well, due to the use of incompatible technology and lack of capacity in the tunnel. In particular this pertains to the Mascouche line, which has the potential to serve more people than the West Island branch of the REM. Right now it doesn’t, due to lack of stations and lack of service, but those could be added. The REM will cut the line and force a transfer, and not provide enough capacity for future upgrades — this means the people in Montreal-Est will never receive a direct connection downtown via an updated Mascouche line. The issue also pertains to the St-Jerome line, which has the potential to be a rapid transit line serving the North of Montreal and Laval. It also pertains to VIA rail, which needs to access the tunnel for the most efficient routing between Quebec City and Toronto. A second issue is that the connections with the existing bus and metro network. In particular the bus connections will be long and awkward, the stations are placed at bad locations far away from the bus corridors. For example, the Fairview stations is 1.3km from Boulevard St-Jean, a major bus boulevard, meaning a 5-10minute detour to reach the station. At Panama, the transfer from bus to LRT will also involve long walks, meaning the overall time for a bus+LRT trip in the future may not be compatible with buses today, which go directly downtown. So even if the LRT is faster, the long transfer may undo most of the benefit. A third issue is that of financing. Right now the more profitable metro is used to cross-subsidize feeder buses. If the REM project is more profitable due to the feeders bringing in passengers, but those profits are all kept by the Caisse, it may increase the burden on the public to provide those feeder buses. CLAIM #3: The REM stations serve low-density areas. The REM will serve public transit corridors that are currently saturated. This is the case with the bus system on the Champlain Bridge and the Deux-Montagnes train line, whose capacity will be enhanced by the REM. Furthermore, by following existing railway lines or roads, the REM will considerably reduce environmental impacts, while reaching areas that are densely populated. Integration of the REM with other metropolitan transportation networks will allow stations to effectively serve a larger territory and maximize ridership. The REM will ensure faster service over long distances, while buses will facilitate home-to-station access. Note how the issue isn’t addressed: the concern is the placement of new stations in low density areas, the response relates to the capacity of the existing corridors. Then it goes on to claim that the suburbs are densely populated, without backing up that claim or even claiming that the stations will serve those populations directly. There are several branches for the REM, and some of the corridors do have decent ridership (the Deux-Montagnes line claimed as ‘saturated’ has about the same ridership as the most busy bus lines in Montreal). The issue is that the stations are placed so that few will live within walking distance of them. This means people will have to get to the stations either by taking bus feeders (which are not well designed), or by driving to the stations (encouraging driving). The main issue is that most new stations of the REM will be built along highways, where people don’t live today and don’t want to live in the future. Instead of building transit that will strengthen urban areas, they will weaken them. At the same time, stations will be far away from downtown both in the West Island and in the South shore. The termini are in unpopulated areas serving only parking lots that will encourage people to live even further away because they can drive’n’ride quickly downtown. In effect, this will encourage sprawl. one station for everybody else: Panama. Basically the whole city is bypassed, providing only a single station to maybe 80% of the ridership, forcing everybody to pass through that station — while providing two more stations for few people in the middle of nowhere. CDPQ Infra will pay fair market value for the the Deux-Montagnes line, including the Mont-Royal access tunnel, and will preserve public ownership of this infrastructure. The Deux-Montagnes line is currently saturated. The REM will triple the capacity of this line and will quadruple that of the Mont-Royal tunnel. The passage running under Mont-Royal will be provided through a completely electric service. Acquisition and transformation of this line by CDPQ Infra will make transportation in the metropolitan region more efficient, benefiting a much higher number of users. There are several claims in this response, which are somewhat unrelated to the supposed claim. First off, nobody claimed there will be ‘no compensation’. The Caisse has always maintained they will pay ‘fair market value’ for the infrastructure. 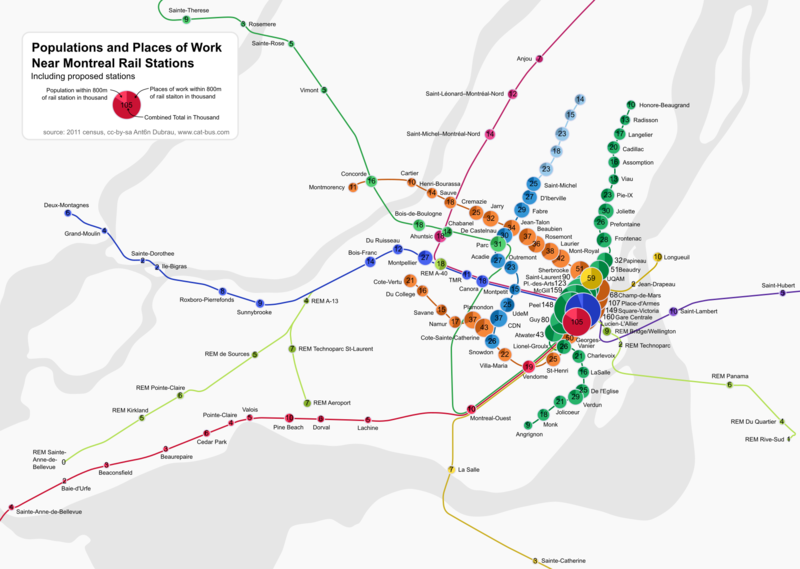 The problem is that there is no market for subway tunnels in Montreal. So right now there is a market of only one buyer – the Caisse. So ‘fair market value’ will be whatever they deem to be fair. The public has invested hundreds if not billions into the infrastructure to slowly build a regional rail network centered around the tunnel. It’s an incredibly important piece of infrastructure, the only direct access downtown — it’s replacement value would be billions today. Note the difference here: “market value” (which cannot be determined) and “replacement value” (which can be determined). The caisse will not pay the replacement value for our infrastructure. 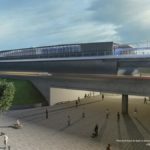 Since the Caisse will kick out all but their own lines from the tunnel, the public may be eventually forced to build another tunnel to bring all the extra lines downtown after all — and that will be a giant waste of money (billions), because we have a tunnel today that could have enough capacity to get all our rail lines downtown. The caisse is not interested in sharing this infrastructure, they want to monopolize it. They intend to rebuild our infrastructure with not enough capacity to build this regional network we need. This brings us to the capacity claim. Note the caisse they said they will “quadruple” the capacity, without saying what it is today and what it will be in the future. Right now, the actual scheduled minimum headway in the tunnel is one train every 7 minutes. Each train can hold up to 2000 people. This gives a theoretical maximum capacity of 17,000 PPHD for the tunnel itself, without any upgrades. The system is not used at this frequency continuously, because the AMT doesn’t have enough trains, and the Deux-Montagnes line is missing double-track sections, reducing the maximum possible headway. These issues are unrelated to the tunnel itself, and could be fixed using tens or hundreds of millions instead of billions. The REM on the other hand proposes to have one train of 600 passengers as frequent as every 90 seconds, although it is unclear whether such frequency can be reliably sustained for such a heavily branched line with few downtown stations. Assuming this will work, it would provide a maximum theoretical capacity of 24,000 PPHD. So the capacity increase is not 300%, it’s 40% — after spending several billions of dollars. The 2007 study to put stations at Edouard-Montpetit and McGill envisioned one 2300 people train every 5 minutes (see page 6 of the study). Achieving this frequency could probably be done with very minor signalling upgrades, if they are necessary at all, and would provide a capacity of 27,600 PPHD. That’s 15% more than the REM proposal, at a fraction of the cost. If we upgraded the existing rail system aggressively, the minimum headway could be reduced from every 7 minutes today down to as often as every 2 minutes, as many cities have done with their heavy rail tunnel (like the RER in Paris). We could get a line with a capacity of 40,000 PPHD or maybe even 60,000 PPHD, which could serve the whole region. But once we sell the tunnel to the Caisse, this cannot happen, because the contract between the Caisse and the government disallows the public to take any control, and the Caisse intends to convert the infrastructure to an incompatible technology that can not be applied along existing rail corridors that also serve freight. It is a legal fiction that the assets of the Caisse are owned by the public — they are being managed by the caisse for its depositors. And most of those depositors (62%) are the employee pension funds of government and university workers. Effectively our infrastructure will be mostly owned by these private individuals via the employee pensions, with the aim of generating profit. And even if the infrastructure were wholly owned by the Quebec Pension Plan (which is actually only 23% of the caisse today), we still have the problem that the interests of public pensions and transit users do not align. Pensions need profits to grow, and good transit is not always good for profit. The Caisse has essentially a legal obligation to sacrifice good transit for good profit. 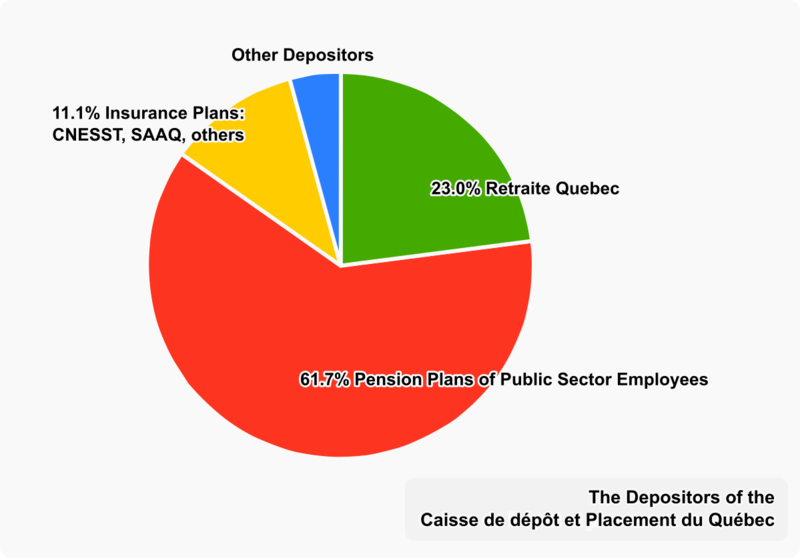 I took a closer look at all the issues relating to privatization in my post “How the Caisse’s “public-public-partnership” is privatization in disguise”. Since the REM route was announced on April 22, CDPQ Infra has met with more than 120 representatives from different municipalities and organizations interested in the REM project, including mayors, environmental groups and heritage specialists. We have organized six open house evenings, at which more than 1,500 citizens were met. An online survey enabled more than 1,000 respondents to share their concerns and propose solutions. Following these consultations, CDPQ Infra refined its project to minimize its impacts. Furthermore, CDPQ Infra requested public hearings on the REM project, led by the Bureau d’audiences publiques sur l’environnement (BAPE). The solution by the CDPQ was largely presented as is, presented in April has a near final solution without discussion with any stakeholders. Since then the CDPQ supposedly has talked to many people, but there have mostly been only small cosmetic changes. So far, big issues have not been addressed. Since the project is privately planned, and the AMT is currently being dismantled, it’s unclear whether any public expertise in transit has had any meaningful influence on the project. At the same time, many important documents, like the ridership studies, evaluation of route options, evaluation of technology choice, financing scheme, the purchasing agreement, and even the original mandate that the government gave to the Caisse have not been published. Under the CDPQ Infra model, the government will continue to be responsible for identifying needs and priority projects, and for setting the main project parameters. The government can however entrust CDPQ Infra with the responsibility of proposing technical and financial solutions, and taking over execution and operation of infrastructure projects. For the REM, committees and working groups involving different ministries are in place and construction of the project is conditional upon the government’s green light. Calls for tenders will comply with international best practices in terms of transparency and competition, and the integrity of the process will be validated by an independent expert. Bidders will be required to obtain a certificate from the Autorité des marchés financiers. Right now the government could control the project, but since the whole scheme was concocted between the Liberal government and the Caisse, it seems they are really keen on getting this built, without worrying too much about details. It is quite possible that the Caisse is meeting with the MTQ, but that ministry has fairly little expertise in transit. 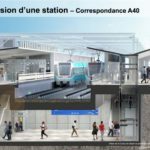 The project was basically presented as is, and the Caisse has shown that they are only willing to make cosmetic changes, while being unwilling to address major flaws. The fares paid by users will not be set by CDPQ Infra but rather by the future Autorité régionale de Transport métropolitain (ARTM), in consultation with CDQP Infra. The ARTM will be responsible for managing and planning transportation in the Greater Montréal area. Its mandate will be to integrate and simplify the hundreds of different fares (over 700) currently used in the metropolitan region. CDPQ Infra expects that REM users will use a single transportation ticket and will pay a rate, to be integrated and comparable with rates currently in effect. The REM’s profitability will instead come from high ridership, very competitive bids and a rigorous control over operating costs. This is all good and well, but these are just promises. Promises like great integration with the existing metro and buses; or the promise by Finance minister Leitao that no existing lines will be privatized (we’re now privatizing the Deux-Montagnes line). People have done calculations that appear to show this scheme cannot be profitable without substantially increasing fares. All we got from CDPQInfra as a response is promises like the one above, but they didn’t give us their business plan, or an exact idea of how the costs will flow and what the ticket prices will be. The CDPQInfra’s mandate is to make profit from the line, so pointing to the ARTM as the organization that will set fares is just bizarre. The public needs to know how much we will pay for every single rider, and how this financing will work, because we have to pay the fares and we have to finance the line using billions of taxpayer money and more billions worth of public assets. CLAIM #8: CDPQ Infra is working hastily and its compressed timetable does not allow it to properly carry out this major project. CDPQ Infra is committed to efficiently carry out the public transit projects under its responsibility. This efficiency implies no decline in rigour. For this purpose, CDPQ Infra has proposed an ongoing optimization process and a request for proposals that allows bidding companies to propose creative and more competitive solutions. Several projects around the world have been successfully carried out with schedules comparable to those proposed by CDPQ Infra. The public has only been aware of this project in its current form since April 2016. The CDPQ seeks to have their contracts and financing set in stone early in 2017. For a project this big, that will affect transit for the next hundred years, that will cost billions of dollars, will affect development for decades, we have less than one year to study and evaluate the project, then it will be set in stone. Most transit at this scale is built from regional transit plans that go decades into the future to identify needs and corridors to build transit. Having a project at this scale from the first time we hear about it to the time it’s set in stone of less than one year is simply insane. Transit plans should be made decades into the future, and this is actually one of the major weak spots of the REM. After this project, what follows is again unknown – especially due to the use of technology that’s incompatible with other lines, and the low capacity in the trunk line. I’m concerned about how future lines will connect to it, in particular VIA and the transit corridors that are currently the Mascouche and the St-Jerome line, which have the potential to serve as urban rapid transit. We need a proper regional rail plan that will cover not just this one project, but the ones that follows and the ones after; and the REM should be built to integrate with that. Thank you Anton. This is another very good post! I’m a bit surprised though that there is no mention of the potential impacts on the Vaudreuil-Hudson line, by draining (an unkown amount of) its current ridership. Was mulling the project over again and came up with another missed opportunity in regards to urban development in Montreal. With the high rise development going on around Lucien-L’Allier investing in the most patronized train service leaving the station would make sense, especially when it’s poised to be connected to the airport (15-20 minutes from the station). The amount of money to electrify the VH line, create a airport spur with 30m headway and accomplish all day headway of 60m for the line running EMUs would be a fraction of REM and accomplish 2/3 of its stated goals, and the ones it covers it does more efficiently as the VH line has the commuter history and follows the population centres of the west island unlike the St. Anne branch of REM, and the airport station shell already exists at YUL.